November 2018. Share Annual Awards Day 2018. Share Board of Trustees. Legacy leaflet. Share Christmas wreaths. Shop for Share at AmazonSmile. New Share staff. If the smiles and giggles are anything to go by, you can see we had another fun, successful and happy Awards Day this year! And, with a growing body of students achieving ever greater things, there was of course much to celebrate. A special year, indeed, as we also celebrated our Autism Accreditation by the National Autistic Society at the event. Thank you to Cllr Piers McCausland, the Mayor of Wandsworth, and Marsha de Cordova, our local MP for Battersea and the Shadow Minister for Disabled People, for joining us on our big day and doing the honours by presenting certificates to all our worthy recipients. 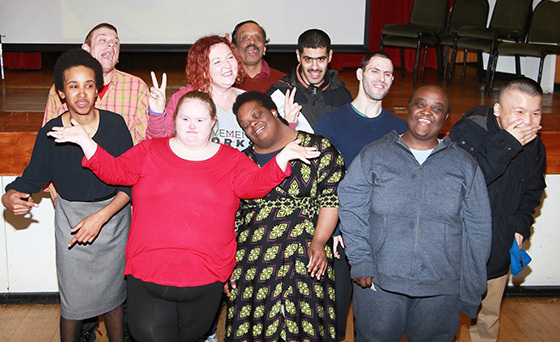 Thank you, also, to our partners at Movement Works, who specialise in developmental movement dance and provide a regular movement dance class for students at Share, for getting all our guests moving, jigging and mingling. 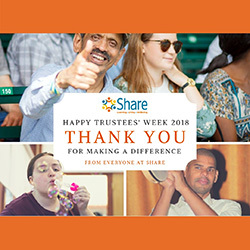 Earlier this month we celebrated Trustees' Week. 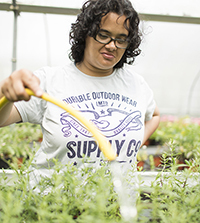 As always, we are immensely grateful to everyone who volunteers their time and share's their experience to help grow Share and make a difference for disabled people. This year, we've had a number of new trustees join Share's Board, including a new Chair, Kate Heaps. Which, of course, means we say farewell and huge thanks to others, in particular, the outgoing Chair, Bill Morgan, and Phoebe Scriven, who have both supported our work over the past few years. And, if you ever need any encouragement to become a Trustee, be sure to read Phoebe's engaging article on life as a 'youth trustee' – Trust me, I'm a Trustee! 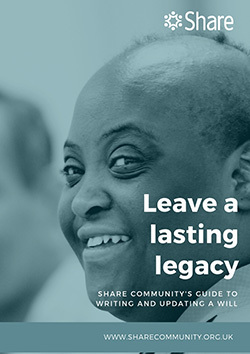 Share has published a guide to writing and updating a Will. This document provides useful information on why it is important to make a Will, the things you need to consider when making or updating your Will, what the process is and who to contact to help you draft and register your Will. 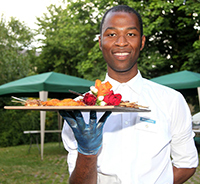 If you'd like to remember Share in your Will, please contact Share's CEO, Annie McDowall, in confidence, via email anniem@sharecommunity.org.uk or telephone 020 7801 9817. Make a difference in your community even after you've gone. 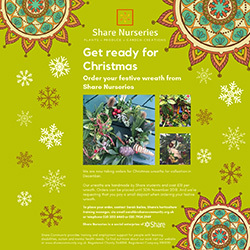 Share Nurseries Share's gardening social enterprise, is taking orders for its unique handmade Christmas wreaths. If you're shopping on Amazon for Christmas, don't forget to shop using AmazonSmile to support a good cause. Click on the link https://smile.amazon.co.uk/, choose Share Community as your chosen charity, and shop away. Amazon will then donate 0.5% of the net purchase price (excluding VAT, returns and shipping fees) of eligible purchases to Share at no extra cost to you. AmazonSmile is the same Amazon you know, with the same products, prices and service. 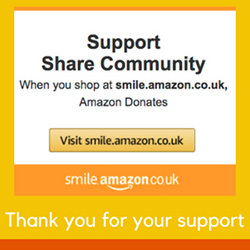 Support Share Community by starting your shopping at smile.amazon.co.uk. Amazon will be holding its Cyber Monday Sale starting on Monday 26th November 2018. A warm welcome to our latest new member of staff, Alice Gough (far left), who joins us as Project Support Worker. This month, we also have Diana Sawaya (left) joining the staff team officially. Not really a new face at Share as Diana has been working as a member of our bank staff team for some time, so it is really great to have her on board as our new Independent Living Skills and Art Tutor on a permanent basis. Visit our website to find out more about working and volunteering at Share, or contact Leanne Wood, Share's People and Projects Manager, via email leannew@sharecommunity.org.uk or telephone 020 7801 9825 for more information. Saturday 18 May 2019. Plant Sale and Healthy Living Community Day. More information coming soon.